You're already on a lucky streak when you check into this fantastic Las Vegas hotel that's convenient, affordable and luxurious. McCarran International Airport is only a few minutes away and so is the Las Vegas Strip. However, if you're in town to visit the Thomas and Mack Center, University of Las Vegas or Las Vegas Convention Center, you can sleep in a little late. This Las Vegas hotel is nearby all the attractions. We are now offering shuttle service to the Strip of Las Vegas (drop off at Tropicana Casino). Please see front desk for any questions and how to schedule the shuttle. Proximity to McCarran Airport with free airport shuttles is just one of the perks. This Las Vegas hotel is 100% non-smoking and off the strip, but still close to the action. Avoid the smoke filled amenities that the city's known for and relax during your getaway. The proximity to University of Las Vegas and Las Vegas Convention Center draws in attendees from around the world. The Consumer Electronics Show and SEMA (after market convention) are popular events. However, nature lovers en route to the Grand Canyon, Hoover Dam and Lake Mead also enjoy a decadent stay at this Las Vegas hotel. 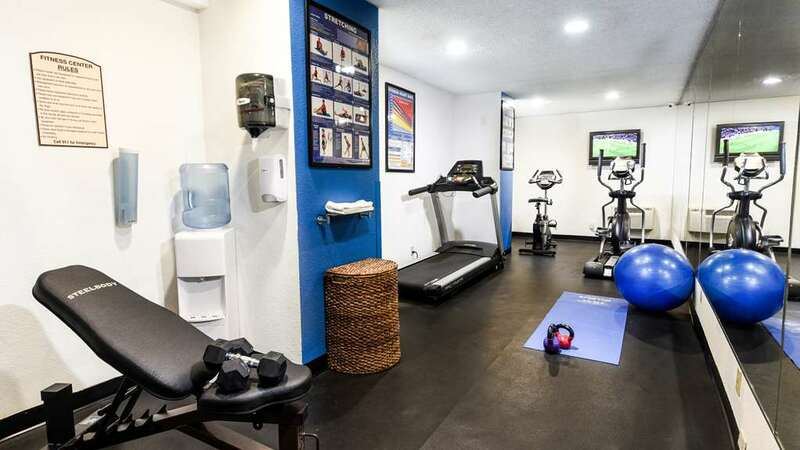 Our Las Vegas hotel is near the MGM Garden Arena, PBR, the National Finals Rodeo, Nellis Air Force Base, Las Vegas Motor Speedway, March Madness, National Association of Broadcasters, and NBA summer basketball. Traveling to Vegas on business is always a sweet deal. Our Las Vegas hotel is proud to regularly host employees of Atlantic Aviation Services, Cemex USA, Ikon Office Solutions, Desert Spring Hospital, and the Howard Hughes Center. Business and leisure travelers alike delight at the complimentary breakfast spread. Save your appetite every morning with a delicious selection of steaming hot waffles, fresh fruits and pastries, cereals, chilled juices and 100% Arabica coffee. You deserve to get your morning started right. Combine our heavenly buffet with top notch service. Enjoy your stay. Pink Taco: 1.00 mile(s) from Pink Taco, fast food, American, open for: breakfast, lunch, dinner, located inside of Hard Rock. This well-known favorite puts a trendy spin on California/Mexican food. Hard Rock Cafe: 0.50 mile(s) from Hard Rock Cafe, full service, American, open for: breakfast, lunch, dinner, 4475 Paradise Road 702-733-8400. Good food and good music with a collection of artifacts encompassing the history of Rock-N-Roll. Rock climbing - 18.00 mile(s) from Red Rock Climbing Center, rock climbing gym for various skill levels. Boating - 30.00 mile(s) from Lake Mead, recreational area for boating, skiing, and hanging out near the water. From: California or Utah. Take Interstate 15 to Tropicana Avenue Exit 37, then head east to Paradise and turn right. Continue for 0.5 blocks to the Best Western McCarran Inn. From: Arizona. Take Highway 95 to Tropicana Road westbound exit. Go approximately four miles and turn left onto Paradise, right after University of Nevada Las Vegas, UNLV. The Best Western McCarran Inn is on left 0.5 blocks. Red Rock Canyon,20.00 mile(s) from Red Rock Canyon, beautiful hiking and biking recreational area.